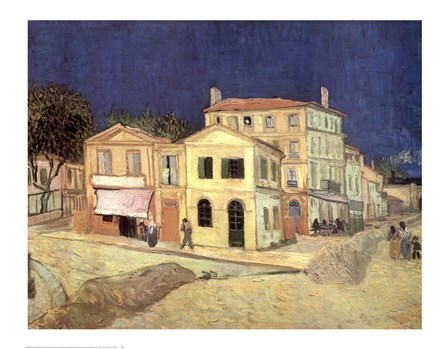 In 1888, Van Gogh had had enough of city life and left Paris for Arles, France. Van Gogh, inspired by the colors of the landscape, had a plan of creating a utopian colony of artists. He rented a studio in Arles, “The Yellow House”, so named because of its color, and invited his fellow artists from Paris to join him. He hoped to create a community in which artists could work together, teach and learn from each other and produce works that were unhindered. Paul Gauguin was the only artist to take Van Gogh up on his offer. In anticipation of Gauguin’s arrival Van Gogh planned to cover the walls of the house with paintings of Sunflowers. Gauguin arrived at The Yellow House in late October of 1888. Gauguin’s arrival launched the Studio of the South. In the following nine weeks the two artists not only lived and ate together but worked together. Both had different ideas of painting, Van Gogh painted rapidly and preferred to work with models or from nature while Gauguin worked more slowly and believing that art was to be more abstract he preferred to paint from memory. The two artists painted daily, frequently painting while sitting side by side painting the same still life, model, or landscape and sometimes even painting each other. Quickly the tensions between them were too great to deal with and Gauguin talked of moving back to Paris. During one argument Van Gogh threatened Gauguin with a knife and ended up cutting off a portion of his own ear. Following this incident, Gauguin returned to Paris and Van Gogh went to the Saint-Paul Hosipital in Saint-Remy. After his hospitalization Van Gogh returned to The Yellow house and painted Self Portrait with Bandaged Ear. The time at The Yellow House was bookended by Van Gogh’s two most famous paintings of the time the idyllic Sunflowers only to be followed some weeks later by Bandaged Ear. Disappointingly, Van Gogh’s grand vision of The Studio of the South utopian art colony was never completely realized.